A-ONE offers a very effective line of acid-based metal cleaning chemicals and they are also great for cleaning radiators, fuel tanks and other aluminum surfaces. These concentrated compounds are highly effective for the cleaning and passivation of steel and aluminum. All products in this section are corrosive in their concentrated forms and should be handled with proper PPE. 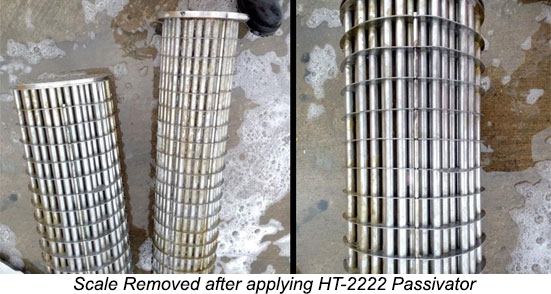 This proven passivation product contains NO NITRIC ACID and does an incredible job passivating and removing stains. For best surface contact and even coverage inside a tank, use with our Tank Truck Fogger. 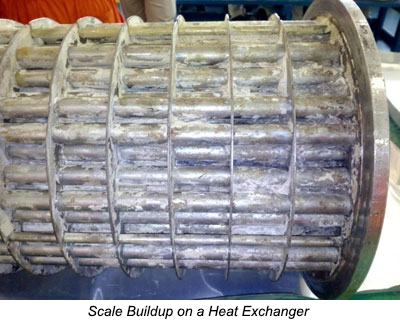 This amazing product is also ideal for removing scale form heat exchangers and heating coils as shown in the pictures above. This highly concentrated brightener is a staple for washing tank trailer exteriors. While utilizing our "Two-Step" exterior application system, Dyna-Brite can be used in conjunction with FleetWash to offer a brush-free trailer wash. Refer to Truck Wash Chemicals for more information about our hands-free dilution systems. Citra-Brite is a citrus-based, environmentally friendly aluminum brightener concentrate comprised of only biodegradable acids. Very effective acidic cleaner for removing rust and scale. Leaves a finish in iron tanks to resist iron oxide formation.